Released for the celebration of the 75th anniversary of the 1939 classic "The Wizard of Oz", everyone's favorite heroine is brought to life in a different form, a sweet little mouse! 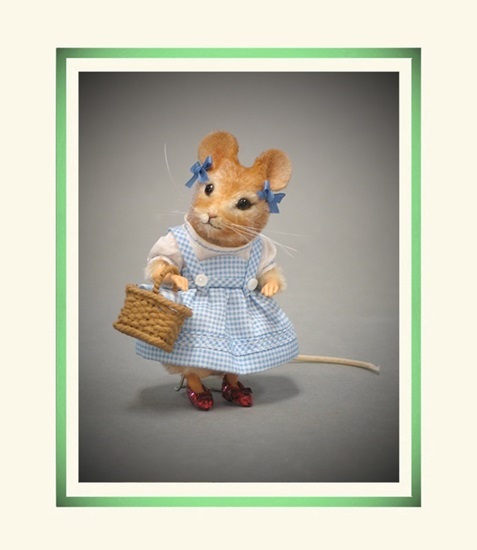 The first piece in the exciting series of mice celebrating the 75th anniversary of the beloved classic, "The Wizard of Oz", we are thrilled to share "Dorothy" a adorable pint sized mouse that will squeak her way into your heart. Dorothy is made of fine mohair plush with realistic shading, resin hands and feet, brown glass pupil eyes, inset whiskers, and a leather tail. Measuring just under 3" tall, a built-in metal stand provides effortless display. Dorothy comes outfitted in an authentic costume made of custom-made miniature gingham fabric with tiny buttons. Her blouse is made of imported 'fairy cloth' cotton with embroidered trim. On one arm Dorothy holds a miniature basket handwoven at the RJW studio. On her feet she wears the smallest imaginable pair of the famed Ruby Slippers! She is one of a limited edition of 250 pieces, and comes with a signed and numbered certificate of authenticity.